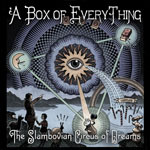 Share the post "Album review: THE SLAMBOVIAN CIRCUS OF DREAMS – A Box Of Everything"
Who? And where the hell is Slambovia? Not another Eastern European bloc state looking to dig its snout into the EU feeding trough? No, it’s a state of mind of a New York indie outfit led by Joziah Longo. Brigaded under the ever broadening ‘Americana’ badge, presumably because of the line-up – Longo plays guitars and harmonica, Tink Lloyd accordion, cello, flute and theremin, Sharkey McEwen guitars and mandolin, and Felipe Torres drums and percussion. But ‘A Box Of Everything’ is a long way from what I would call ‘Americana’. It’s a throwback, certainly. But more to the late 1960s when rock was beginning to cut its infant teeth. And when you dive deeper, A Box Of Everything – although it stands well as a single piece of work, is actually a ‘best of’ originally released in the US in 2014 and spanning the band’s four album releases between 1998 and 2010, and given a ‘push’ here to support some 2016 UK dates. Described by some as ‘The Hillbilly Pink Floyd’ that really doesn’t do the band justice. There’s shades of Dylan (and The Wilburys), Floydian moments, and Neil Young, but perhaps most strikingly of early Bowie. If some of the songs here were presented as the missing link between David Bowie (1969) and The Man Who Sold The World (1970), many would be duped. There’s even a whimsical, and previously unreleased number – ‘A Very Unusual Head’ – that is the missing link to Bowie’s ‘Laughing Gnome’. There’s some wonderful material here – the impossibly infectious ‘Living With God’, the Barret-era wig out in epic ‘Talkin’ To The Budda’, the Southern rock of ‘Tink (I Know It’s You)’ with some marvellously uninhibited lead guitar work, and the gentle Bowie/Lou Reed-influenced ‘Lost Highway’ to name but a few. This entry was posted in ALBUM REVIEWS, ALBUM REVIEWS (Mobile), All Posts and tagged A Box Of Everything, album, compilation, psych, psychedelic, review, rock, roots, The Slambovian Circus Of Dreams. Bookmark the permalink.